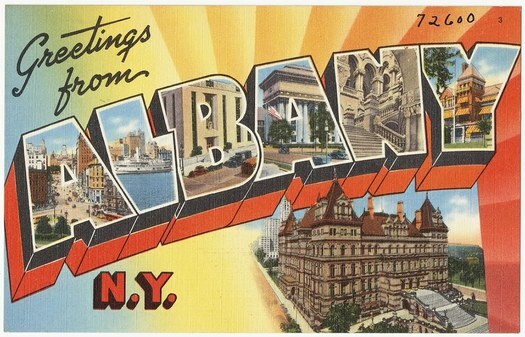 I moved here recently for school and was wondering where I could find cheap Albany postcards for the people back home. Thanks in advance! It's been a while since we've browsed a rack of Albany postcards, but we don't remember many as being kind of cool or interesting. Maybe things have changed. Or maybe this is an opportunity for someone to make some good cards. So... got a suggestion for Wesley? Please share! Any postcard graced by Nipper is a cool postcard. But other than that I can't think of any Albany postcards that aren't the run-of-the-mill tourism type visuals. Local postcards are available at the Hallmark in Empire State Plaza, the last time I checked. I used postcards from Lake George as my save the dates for my Lake George wedding a few years ago. So that's one use for the humble postcard. Another idea: check the local museums that have decent gift shops (Albany Institute etc) because they may have postcards that feature interesting objects from their collections. But I don't know if they are cheap or not. The NYS museum has some post cards in their gift shop. Pretty standard, but my friends from out of town seem to enjoy them. Troy Cloth & Paper might have some on occasion, too. The Albany Heritage Area Visitors Center Gift Shop has a large selection of local postcards that are very affordable. You can also find many other unique, local, and handcrafted items. We are open 7 days a week and are located downtown at Quackenbush Square (Broadway and Clinton Avenue). Hours are listed on our website. Pfiel's Hardware in Troy carries a line of Troy postcards -- and new images are added yearly/seasonally. There's a store in Chatham Mass called Maps of Antiquity that has a box containing hundreds of old postcards from the Lake George region. Most were cards that were actually written on and sent and to read the messages is fascinating. Troy Cloth & Paper definitely has some great Troy-related cards (not sure if they're in postcard form). Otherwise I think the Visitors Center is your best bet for standard commercial cards. Used to be a time when every newsstand had them. used to be a time when there were lots of newsstands. Stay away from the ones at the NYS Museum. THEY'LL MAKE YOU VOMIT! And no one you send them to will ever want to come here. @Laura -- the shop at the New York State Museum is regrettably operated by an outside contractor that is in the business of running museum shops, but does a lousy job of it. Many years ago the shop was run more or less in house, with a savvy local buyer, and the stock was fabulous, including NYS arts & crafts. Not any more. Now it's kind of generic and certainly not a destination for shopping for gifts or anything besides a souvenir. Local postcards, all taken at night! If you want something a bit more memorable, I'd suggest Antique/second hand shops. It's usually not too hard to find some that were never used at all. Try the Albany Hilton gift shop for new post cards. If you're looking for vintage post cards Silver Fox Salvage on Broadway has a pretty good selection and they are often regional. Great question! I send postcards around the world via Postcrossing (www.postcrossing.com), so I am always looking for local postcards myself. In addition to the locations already mentioned, the Book House in Stuyvesant Plaza has a very good selection - well, the last time I checked, anyway. If you're interested in Saratoga Springs postcards, Impressions, on Broadway, has a nice selection. In the past, I've also ordered in bulk from Postcardstop.com. Based in Michigan, this small mail-order business carries an array of postcards from cities and states around the country, and the prices can't be beat (40 cents for a Nipper postcard!). I was just at AIHA for the Jane Austen program and they have a charming selection. I really thought the "Troy at Night" postcards would be one of those that you see in every city with "Troy at Night" printed on a black background.